Think Trump wasn’t serious about building a wall between the United States and Mexico? Consider that the campaign is over, and President-elect Trump sent a shot across the bow to Speaker Paul Ryan. As sure as Trump kept his campaign promise to save jobs at Carrier, the President-elect appears to be just as serious about building that wall. Donald Trump: Oh, we’re going to work on the wall, Paul! You think we’re playing games. Somebody said the other day, well now that Trump won he’s really not going to build the wall. 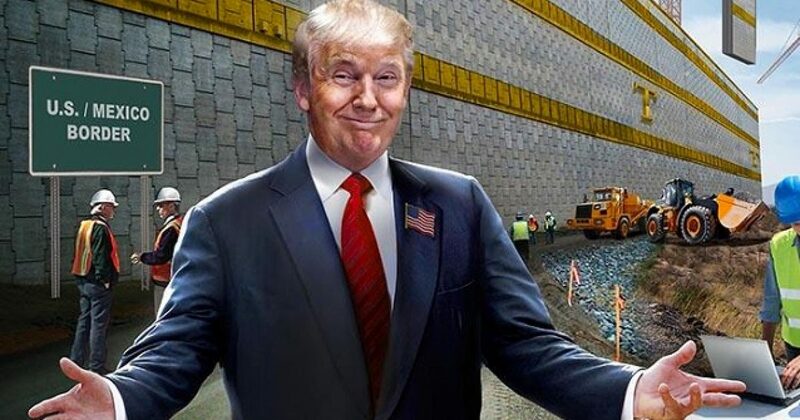 We’re going to build the wall, Ok? Wisconsin is one of the many stops for Trump, who is holding what I call his “Thank You Tour.” Ok, it’s really the “F You Tour!” to all the Hollyweirdos and Never Trump crowd, with a few RINOs for good measure. Trump plans to be in Pennsylvania, Florida and Alabama later this week, where he will remind those good citizens of their great choice to make him 45. Trump remains on a tear, economically speaking. Further, the man is making Barack Obama look like the failure of century. Along with saving jobs at Carrier, Trump has also gotten a commitment from SoftBank to invest $50 billion in the United States and create as many as 50,000 jobs. Apple is considering bringing a manufacturing plant back to the U.S.
Because of Trump, Ford is rethinking its strategy to build a manufacturing plant overseas, preferring to leave the plant in America. And then there was Dow Chemical, who announce at a rally in Michigan, that not only would they increase their $7 billion investment in America in manufacturing, but they would build an innovation center in Michigan, effective immediately. Trump has accomplished all this, and he’s not officially president yet. Now we get this news that’s would be a kick in the balls to Obama, if he had any. IBM CEO Ginni Rometty pledged to hire and train workers in the United States as she and other technology executives prepared to meet on Wednesday with U.S. President-elect Donald Trump. “We have thousands of open positions at any given moment, and we intend to hire about 25,000 professionals in the next four years in the United States,” Rometty wrote in a USA Today piece published on Tuesday afternoon. As for wall between the U.S. and Mexico, you can expect Trump to announce a date to begin construction, when he stumps in Texas or Arizona.